It was truly an adventure on the trails this morning. In a little more than an hour I managed to take a header into frozen rutted mud, lose the trail at least a half dozen times, get trapped multiple times in thorny brush and trees and scale a barbed wire topped fence. It was great fun except where it was no fun at all. I'll start from the beginning. It was 17 degrees early in the day but Weather.com showed that the temperature would begin to rise by mid-morning. I decided that I'd wait until after 9:00 AM, when the Muttontown Preserve opens, and go for an easy trail run. I eagerly anticipated this run because I was zero-for-two in terms of successfully getting into the place. The first time I simply couldn't find the entrance and the second time I was there too early. Today it was easy getting in. The gates were up and the parking lot was empty. The trail head is inviting and the trail out looked perfect for a scenic and pleasant run. I took off along this wide path and rounded a few lefts and rights. The elevation was slowly rising but I was fresh and I figured I may out-and-back the trail so I'd have some nice downhills to enjoy on my way back. Soon the track narrowed and I encountered some icy snow covered patches. I had on my NB trail shoes which can handle some technical terrain but the trail had frozen and rutted making it hard to find many flat spots to land on. I was worrying about turning an ankle when, at around the 1 mile mark, I caught a root and flew forward, landing on my left knee and wrist. I decided to double back to a section of the trail that branched off about a quarter mile before this point. The branching trail seemed better groomed and I was looking to avoid a repeat of my fall. 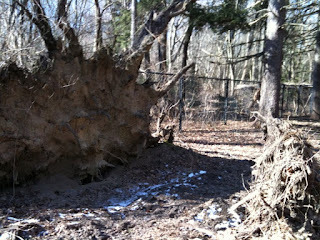 As I made my way there I stopped to take a couple of pictures some fallen trees that had caught my eye. 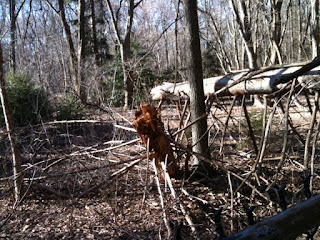 One was covered with whorling branches that gave it a view from the front like a wheel hub and spoke. There were two other trees that had fallen in opposite directions, their roots and trunks prominently displayed, that opened enough room for the path. I wondered if the trees were felled to allow passage along the trail (unlikely) but I'm curious what it looked like when those trees were still standing. 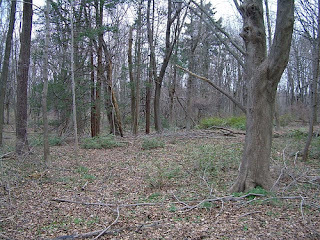 I eventually made my way to the southern end and though there was lots to see and very different terrain to explore I did not see the relics of old mansions that made this the "Mystery Trail." I used my iPhone compass to help reorient me north but I found so many switchbacks I didn't know what to follow. Worse than that, some trails seemed to close up until they disappeared so I needed to bushwhack my way over to new trails when I could find them. Eventually, with further help from my compass and the direction of the sun I was able to head north on a clear trail. I even passed by the remains of an old mansion but didn't stop to explore because it was getting late and I wanted to finish the run by 11:00 AM. The north trail terminated at a point where I needed to take a perpendicular trail either east or west. I guessed west and was rewarded to see it bend north so I stayed on course. This happened two more times. I eventually reached the most northern point in the Preserve but I needed to make my way west to the exit point. Easier said than done. There were chain link fences with barbed wire tops that obstructed me from getting out in any easy way. I bushwhacked my way west until I got trapped between a fence and a shallow frozen river but at that point I could see the building that sits next to the trail head. I tried to find my way past the fence but the tree growth was becoming more dense. There were lots of branches on the ground and thorny branches snagging my clothes as I attempted to find a break along the fence. I was standing twenty feet from my car that I could see through the chain link fence but I had no easy way to get there. I decided to make my way south instead. I figured the fence would eventually end or I'd come to an open gate (after all, how did I end up on the other side?). Before I found that I saw a section of the fence that was bent down at the top with the barbs facing frontwards instead of straight up. Helping that were some logs and branches piled along the fence and I decided to climb up and jump off to get back inside the Preserve. The drop was about four feet and I was careful to avoid landing hard on my recently bruised knee. I landed well but my running mitten got snagged on the top of the fence and came off. I was able to reach up and snag it back. I was very happy to run the last quarter mile back to my car. It was quite an adventure and now I know some of the mysteries of the Muttontown Trails. I'd like to run it again but I think I'll do it with a more user friendly compass and perhaps a running companion to give me a boost over the fence because I know I'll eventually get us lost. Geez! You have quite the rugged route to take. My latest has been what to do with the possibility of a COUGAR!